The first rooster broke from the tall switch grass just moments from our first steps on the sprawling grounds of the Rice Creek Hunting Preserve near Little Falls, MN. August Gustafson from Kenora, Ontario shouldered her borrowed 12-gauge and soon the brightly-colored bird was tumbling from the sky. Just like that, she had shot her first pheasant. August had some vacation time and decided to come down to visit friends and go on her first pheasant hunt. That took place last weekend in Hendricks with Jason Markkula and included a stop at Jason’s brewery, Bank Brewing Company. While the birds didn’t cooperate much, she was able to see what a walk in the prairie in search of long-tails was all about. 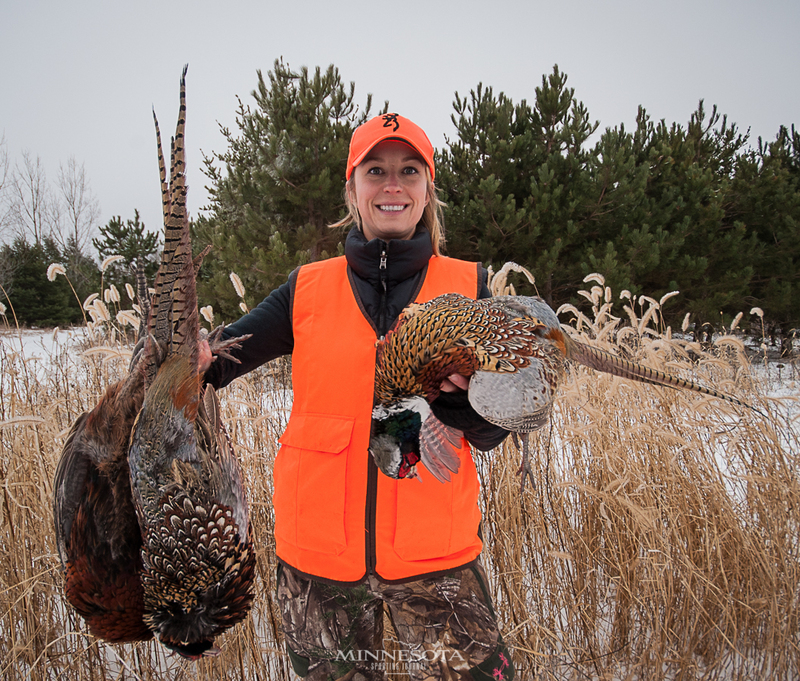 A different experience than what she’d had growing up chasing “chickens” or ruffed grouse. Unfortunately, she didn’t get her rooster there. This weekend we’d be traveling to Hitchcock, South Dakota for a pheasant hunt/fundraiser for “Keeping Kids In outDoor Sports” (KKIDS). “Our mission statement is to educate and enhance the lives of diversified youth through mentorship and hands on training of various outdoor sports,” Jeff Boer from Wild Dakota TV explained. We wanted to tip the odds in August’s favor while in South Dakota so we decided to point south from Brainerd and head to LeBlanc’s Rice Creek Hunting preserve. It would be August and myself, along with two labs, Mika and Cumara. We worried that hunting long, narrow strips of corn and switchgrass without posters might have the birds sneaking out the back-end before we’d get there. I also warned August ahead of time that occasionally game farm birds are slower, dumber and you might have to kick them to get them up. This wasn’t the case. From the moment that first rooster flushed, you’d have thought we were on a wild bird hunt (aside from the nice trails that checkerboard their way through the habitat). Birds flushed like late November roosters and offered some long, but makable shots. I’ve also seen preserve birds that seem to fall out of the sky when you shoot in the general vicinity, but one bird took enough pellets to leave a cloud of feathers drifting through the air and still managed to fly out of sight and off the property. Why would are experience differ from other game preserves that I’d been on? We had total of 8 pheasants released-a mix of hens and roosters both. The plan was to let August shoot first and I’d back her up. 20 yards into our first strip of switchgrass, the dogs began to go crazy and I gave her the heads up that a bird could be up ahead. Just like in the wild, the familiar rush of thundering wing beats erupted from the tall grass. August pulled the trigger and soon we had the first of 6 pheasants in our game bags. We finished walking the 80 acre parcel that we were on, while listening to shooting from other fields on the property. Our field was surrounded by thick, tall pines that sheltered us from other groups. Up to 12 hunting parties can be walking the property at a time and hunts take place twice per day. We had seen 5 or 6 roosters including a couple of scratch birds and 3 of our hens. Knowing that one hen was still there, we went back to the edge of the driveway that we came in on. It didn’t offer much for cover so we had avoided it the first time. Immediately the dogs went into hyperdrive and soon August experienced the best part of pheasant hunting: The Flush! The bird exploded 10 feet in front of her, a few words not fit for print were uttered and she had to compose herself before putting the 12 gauge to work. That bird escaped but not before offering a glimpse of what drives pheasant hunters to the fields and sloughs religiously each fall. After our hunt we toured the clubhouse and learned more about what they offer: wedding facilities, lodging, 2 sporting clay courses, turkey hunting and a duck shoot. They also offer a youth camp each year. “We do firearms safety with them,” explained Krista Smude. “It’s been so popular that the kids want to come back every year so we began an advanced camp.” The kids stay at the lodge for a few days and get their firearms safety certificates and learn more about spending time outdoors. Before we left they cleaned our birds and exchanged them for prepackaged pheasants that were already frozen and boxed up. We had a great tune up for South Dakota and hopefully we can get August her 2nd rooster while we’re there! Find more about Rice Creek Hunting here.